Nice is the unofficial capital of the The Côte d’Azur, which stretches from Cannes in the South to Monaco/Monte Carlo in the north. The ‘French Riviera’, is a spectacular setting, with azure waters, yachts, hilltop towns, beaches, and the mountains Alpes-Maritimes in the background. The area is a popular tourist destination, on account of its beauty, beaches, and great weather. Our guide to running in Nice, France features several wonderful coastal routes along the Côte d’Azur. 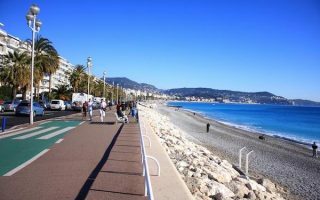 Some of the running highlights in the Nice area are Promenade des Anglais in Nice, a ‘runseeing’ tour of Monaco/Monte-Carlo, and a tour of St.-Jean-Cap-Ferrat. 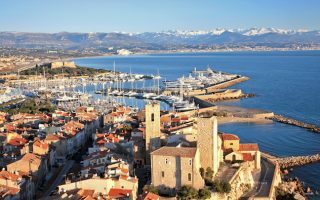 There’s a series of peninsulas, each of which has its own vibe, and great for running: Antibes, Cap de Nice (Coco Beach), Cap Ferrat, and Cap d’Ail. Our routes in these areas areas are a combination of road, seaside promenade, and in sections, ‘coastal trail’, known as the ‘sentier littoral’. There are many beaches in the Côte, but they are crowded in season, and the sand quality is generally not suitable for running. Also note that some of the roads in the area are very narrow, with no shoulder or sidewalk. We’ve paid careful attention to that in designing our routes. One final aspect is that transportation is terrific in this area. It can be really fun to run one way and hop on a train or bus back. A famous 7 km promenade along the Mediterranean. 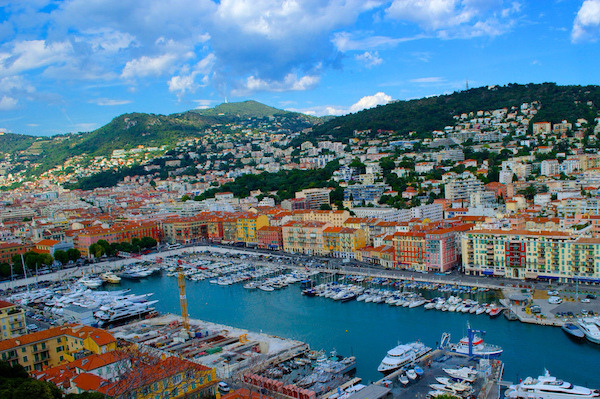 Great water views, boats, marina, and other classic sites of southern France. On a nice day, the Promenade is full of all sorts of activity. Separate paths for pedestrians & cyclists much of way. One of the better, longer coast road running options in the area. It's 5.7 km from Nice to Villefranche-Sur-Mer, with good water views and a decent sidewalk/shoulder much of the way. Run one way and take the train back! Nice detour is 1 km Sentier Littoral. 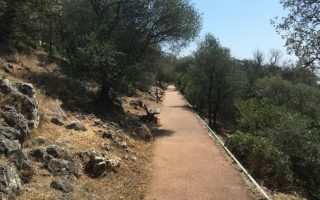 A hilltop forest with picnic areas, olive trees, exercise circuits, hiking trails, boules pitches and a 16th century castle, just a few km east of Nice. 140 acres, 11 km of marked trails, good hills. For an extra challenge, take one of the trails from Nice or Villefranche-Sur-Mer. 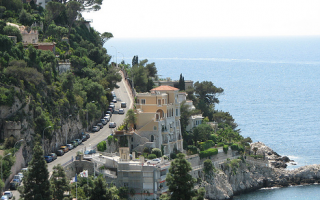 A lovely peninsula in the Côte d'Azur, with several good running options. Waterside running on the western side near Juan-les-Pins; south from Antibes to Garoupe Beach, or 'run the peninsula' for 7.7 km, with water views most of the way. One of the most spectacular runs in southern France. This run has it all: water, views, history, a bit of elevation, and few cars. 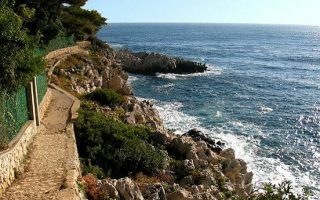 The gorgeous coastal trail goes down to Cap Ferrat and most of the way around the peninsula. About 6.5 km (4 miles). 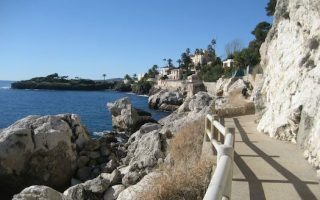 A dedicated waterfront path for 2.5 km between Mala and Cap d'Ail. Another section of the 'Sentier Littoral', with great views. Do it at sunrise! Can be combined with Monaco run, or other sections. Train station in Cap d'Ail. 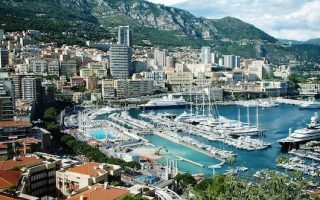 A 5+ mile runseeing tour of Monaco and Monte Carlo. This one's a real mix: beautiful seaside promenades, busy streets, hills, casinos, and fancy hotels. We've mapped out a route featuring the highlights of the area, with the best paths and roads for running. A wonderful waterside run in Cannes, site of the famous film festival, and many shops & restaurants. 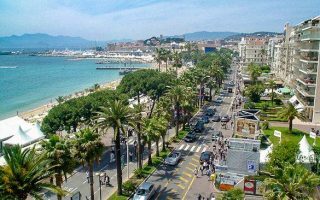 The most famous section is 4.5 km along the Boulevard de la Croisette, but you can continue for another 7 km along the Boulevard du Midi to the Pullman Casino.